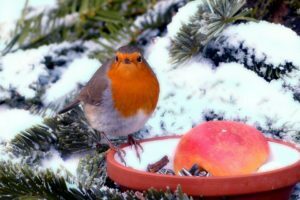 Winter – the worst season for your garden is here and there is no avoiding it. That is exactly why preparing it for the coldest of months is essential. If you aren’t completely sure how to do it or are looking for an opportunity to learn something new, read on, there’s plenty of useful advice here! The worst part about winter is the fact that the ground is usually frozen solid, thus making it impossible for your plants to consume their greatly needed amounts of water. The constant thawing and freezing of plants is extremely harmful and mulch is your best friend here. Use it to limit the damage; spread three inches of mulch on the ground around the plants in order to make sure that a constant temperature is maintained. After you’ve done this, provide a netting, chicken wire or a tree branches-based cover. Additionally, keep in mind that you can do little to help a frozen plant, so if this occurs, simply remove it from your garden altogether. Yes, salt works fantastically when it comes to avoiding human slips and falls, but it is also quite harmful for your plant life. Even if you sprinkle a tiny bit of salt over the walkways and driveways, you are risking it spreading and completely destroying your gorgeous garden. So how to avoid slipping and falling or even crashing your car during the winter? Well, there are other ways around this – use wood ashes, gravel, sand, sawdust or fertilizer in order to make sure that these areas remain safe; just avoid using salt! The bigger something is, the easier it is for it to retain temperature, and plants are no exception. Small plants need a lot of protection, so make sure that you’ve covered them with a plastic bag, a cardboard box, a plastic laundry basket or even a flowerpot turned upside-down. Weigh it down with a brick, a stone, or another convenient weighty item in order to make sure the wind doesn’t blow away the covering. Check up on your small plants on a daily basis – they need a lot of attention during the spring months, let alone when the cold weather comes knocking at your doorstep. Young and delicate plants are especially vulnerable when it comes to winter – their roots are very weak and a stronger breeze can easily rip them from the ground or damage their delicate roots. You can “install” wind protection by hammering a couple of stakes into the ground around the little ones and then wrap a burlap barrier around the stakes as a barrier to deflect wind. When it comes to trees, you should wrap their trunks with burlap or regular tree wrapping. If you live in a region that experiences snow during the winter months, your plants are going to have a hard time getting enough sunlight as it is, not to mention if there’s junk in your garden. This is especially important if you live in a rental with a carefully maintained yard, so when you do your end of lease cleaning, make sure that the backyard is covered, as well. Yes, water freezes in the winter, but this can actually help your plants! By giving off heat and keeping them warmer than the surrounding air, frozen water helps incubate your plants during the cold months. Winterize your sprinkler and run it over the most delicate of plants within your garden on cold nights – this may sound counter-intuitive, but it definitely helps! These clever tricks will definitely help your garden prevail in wintertime. Cover all the outlined basics, take care of the smallest of plants, keep the wind out and don’t be afraid to use sprinklers! These clever tricks will definitely help your garden prevail in wintertime. Winter – the worst season for your garden is here and there is no avoiding it. This entry was posted in Yard and Garden and tagged Enhance your Garden, Frozen Plant, Garden, gardening, Gardening Ideas, Gorgeous Garden, Healthy Garden, Winter Garden. Bookmark the permalink.